Although it is not that much bigger than a scooter, the Twizy is considered safer because it has four wheels, a front airbag as well as seat belts for the driver and the passenger. PARIS -- Renault is counting on its quirky battery-powered Twizy to help win share from Peugeot, Smart, BMW and Volkswagen in Europe's fast-growing car-sharing sector. 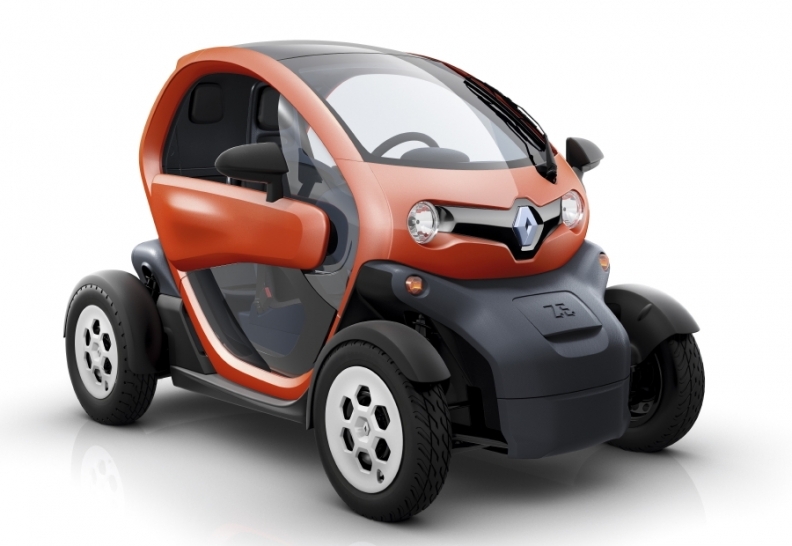 Renault plans to launch its so-called "Twizy Way" car-sharing program around France later this year and expand the program into big European metropolitan areas starting in 2013. According to consultancy Frost & Sullivan, the number of people using car-sharing services is expected to grow from nothing a few years ago to 15 million in Europe and 32 million worldwide by 2020. Car sharing is a popular choice for an increasing number of people who can't justify having a personal car in a city for environmental, space or financial reasons yet don't want to live without individual mobility. Many companies see their car-sharing programs as a way to reach young people, something Renault feels the Twizy can do particularly well because the two-person EV is different from anything else offered in the car-sharing sector. Although it is not that much bigger than a scooter, the Twizy is considered safer because it has four wheels, a front airbag as well as seat belts for the driver and the passenger. Renault will test its car-sharing scheme in the Saint-Quentin-en-Yvelines region near Paris this month with a fleet of 50 Twizy EVs for about 200 people. Pricing was not disclosed, but a Renault spokesman said the fee structure would be comparable to other car-sharing services in Europe, where the French automaker will compete against programs such as BMW's DriveNow, Daimler's Car2Go, Peugeot's Mu and Volkswagen's Quicar. Like other car-sharing programs, Renault will let customers reserve the Twizy via a computer or a smartphone and charging them by the hour or by the minute. Renault is working with local governments for approval to let a customer leave the Twizy at any public parking area free of charge.